This sweet image is from House Mouse, stamped on a scrap of white CS and colored with polychromos pencils. I based the design on this sketch from The Outlawz. 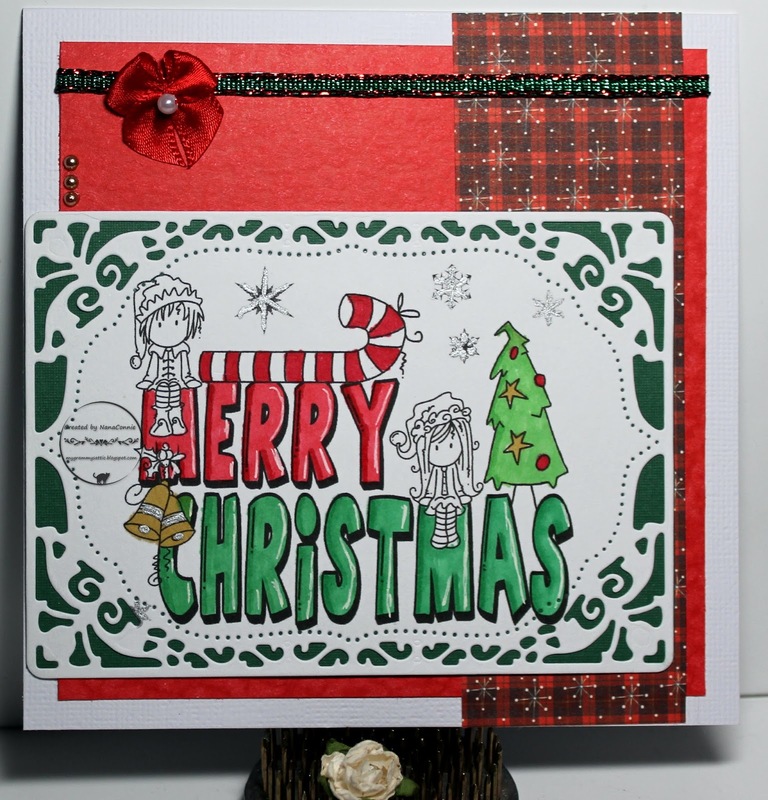 The scalloped die is from Sizzix and the stitched circle die (also a scrap) is by Die-namics. 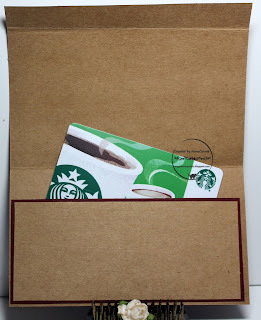 I layered those cuts on top of each other and mounted them onto a rectangle of green CS. 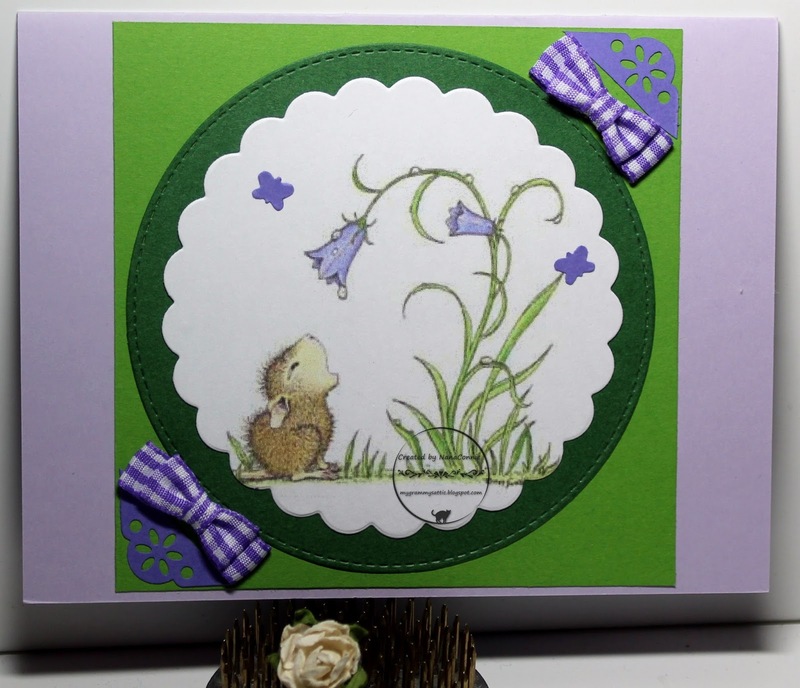 All of that went onto a pre-made, pale lilac, card base. I used a corner punch by Fiskars to cut the purple corners (scraps) and then tied double-bowtie bows from gingham ribbon. Finally, I punched the last bit of scrap left over from making the corner bits and made the two tiny butterflies which are attached to the image. 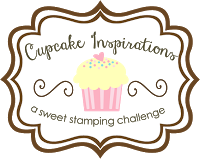 Our latest challenge is starting today at QKR Stampede and we have our usual "Anything Goes" theme but if you want to use the twist, it's "Snowman or Snowflakes." I've used a sweet little snowmen image called "Father and Son" 15901 and the sentiment is also from QKR, "All the Years" 17308. 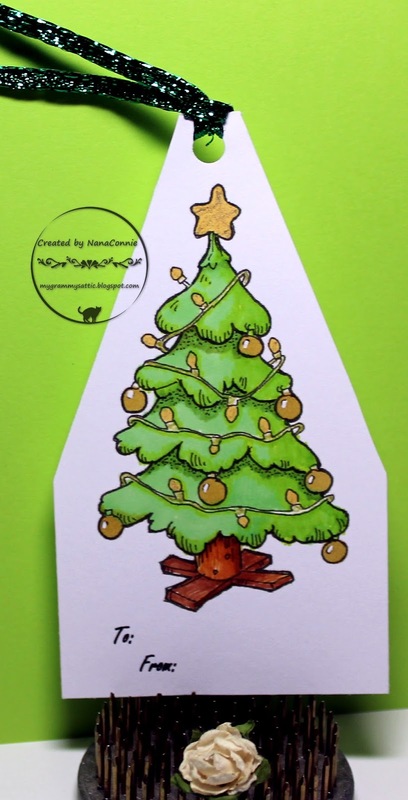 I colored with ProMarkers, and die cut it on an angle with a die from Spellbinders. I printed the sentiment onto sky blue paper, cut it with a small rectangle die from QuicKutz, and added it to the image piece. All of that went onto turquoise CS. 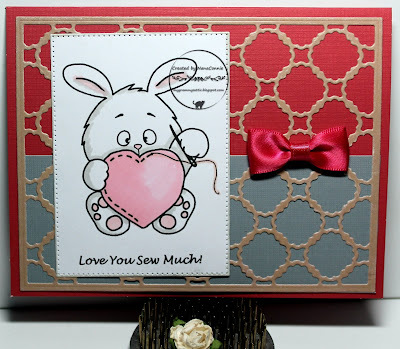 I hand tied a small bow using polka dot ribbon and layered it on just below the sentiment piece. The card design is really pretty CAS but looks more complex because of the fancy die. 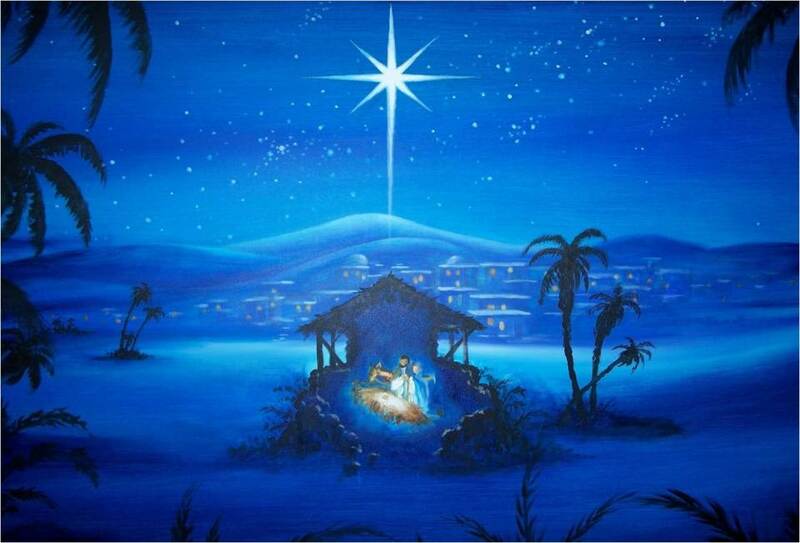 I want to send heartfelt Christmas Blessings to each and every one of you. I also have one simple card for Christmas. 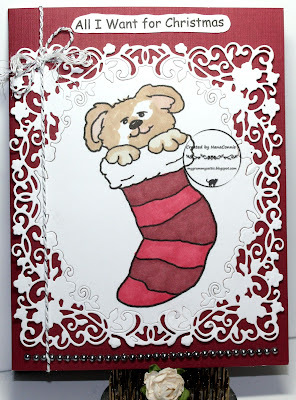 Earlier this month, I did a card using the Nov/Dec Limited Runs progressive challenge image with a dear kitten in a stocking and now we're doing the same for puppies. I colored with my usual ProMarkers, then used a Sue Wilson die to cut the image and the delicate frame around it. I put that onto a deep red card front and added the sentiment. For embellishment, I used some sparkly silver twine and a row of silver pearls. Much simpler in design than it looks. I searched through some really old stamps and found this Christmas ornament which I haven't used in several years so it definitely was time. I originally bought this stamp set along with a set of dies from Sparkle n Sprinkle perfectly shaped to these ornaments. They weren't intended to match the stamps but they worked. However, for this card I just heat embossed the stamp without using the die set. I decided on a fairly simple card with only minimal embellishment. I stamped the ornament with Versamark ink, then embossed it with red EP. I cut it with a rectangle die from Spellbinders, and then cut two layers of CS mats for it (same die set), one tan and one red. I layered those together, then added the ornament but adhered it only across the top of the rectangle. 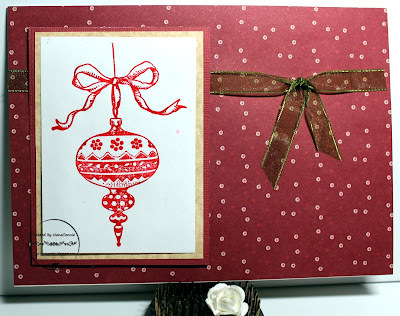 I found some very old dp which had delightful tan snowflakes on deep red paper and it worked perfectly with the mats for the image. 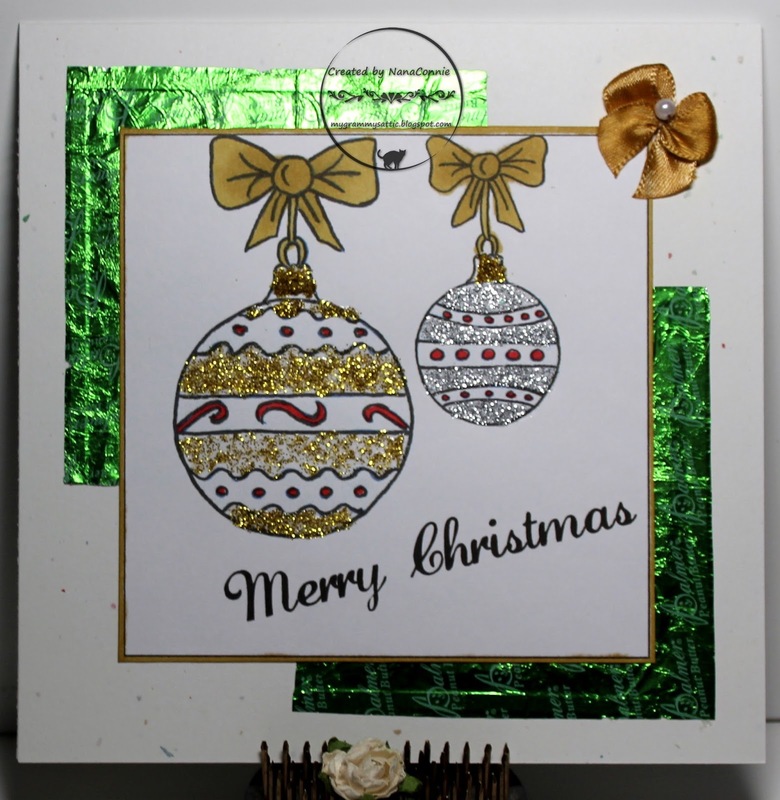 I adhered it to the card front, then took a strip of sheer gold ribbon with green edges and tied it around the card front before adding the image piece. Beyond that ribbon, I left it without embellishment. This fun and funny image from QKR Stampede (Santa in Chimney 16708) shows my #1 problem every holiday season. Thank goodness I don't have to slide down chimneys on Christmas Eve! 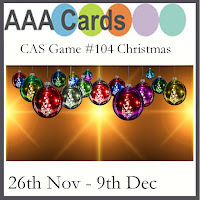 We're starting a brand new "Anything Goes" challenge today and we also have an optional theme of "Santa" if you want to use it. 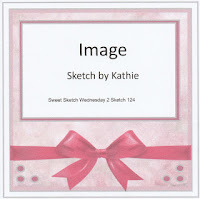 I based my card on Sketch 124 from Sweet Sketch Weds. 2.
of all the ones used in 2017. 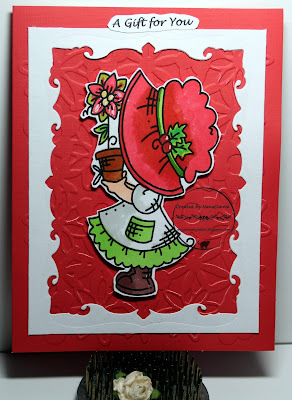 I colored with ProMarkers, then cut the image with a die from Spellbinders. I cut a burgundy frame for the image with another die from that same set. Everything went onto a heather gray piece of CS which had been embossed with my "Linen" folder. 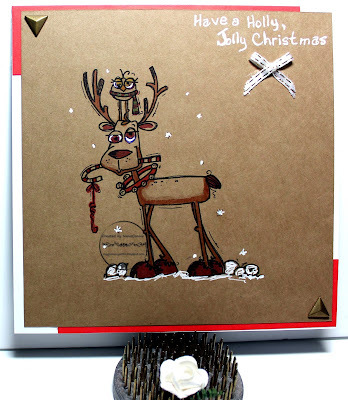 One more Christmas card to share and I have a feeling I'll still be sharing some after Christmas! 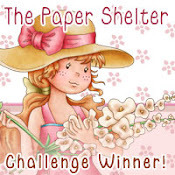 This one uses an image from Bugaboo Stamps with one of my favorite characters, Fancy Sunbonnet. She's just so precious and I adore nearly every image with her throughout seasons. This one, in which she's bearing the gift of a poinsettia plant, is probably my favorite for the Christmas season. Maybe that's because she reminds me of my mother who often gifted poinsettias to family members at Christmas. Each had been lovingly snipped and pot-started from the massive poinsettia plant she tended in our yard. She had more luck growing them than anyone else I've ever known. I started by coloring this with ProMarkers, then I fussy cut the image by hand. 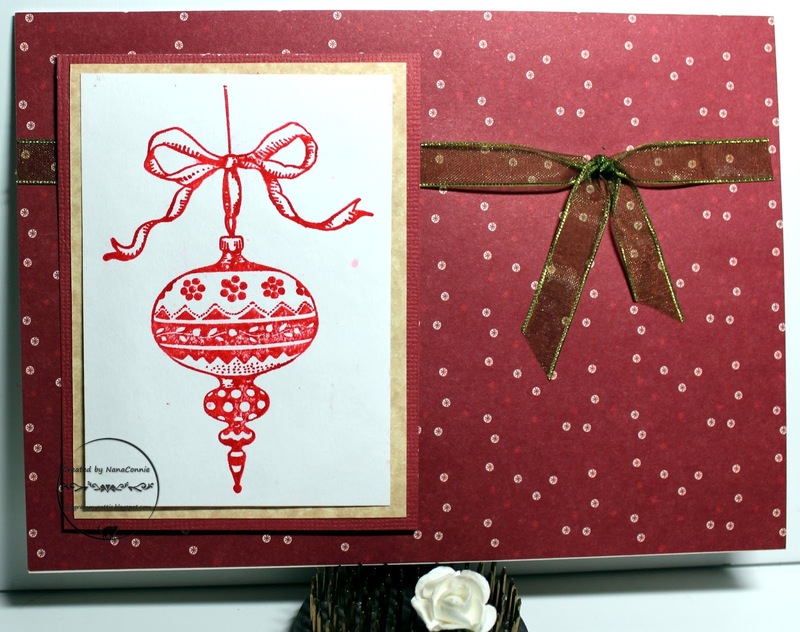 I took a red card base and ran it through one of my Poinsettia embossing folders from SU. 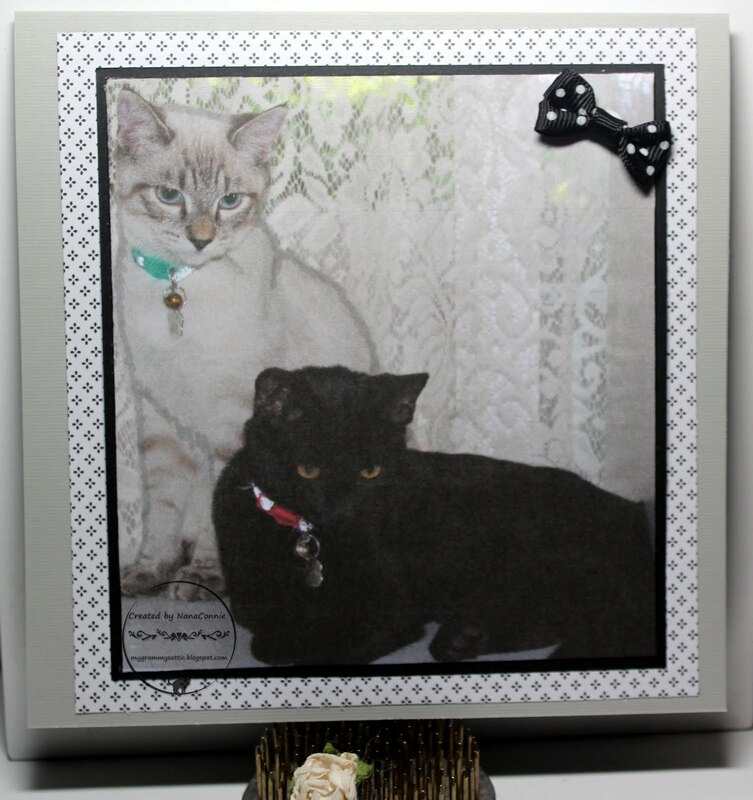 I found a negative scrap frame (Spellbinders die) which I trimmed and adhered on top of the embossing. I used dimensional tape to mount the image inside the frame. I printed the sentiment, hand cut it and added it above the image. This is what happens when the Mousies' Christmas Eve party runs too late into the evening and nobody has enough energy to tote the kids upstairs to their beds. The parents stoke up the fire, tuck the sleepy kids into Santa caps, and stumble off to their own beds. I'm not sure how Santa is going to get down that chimney with the fire roaring but since he has holiday magic, I'm sure he'll manage somehow. I colored with ProMarkers this time, then cut the image and punched the corners. I added a rectangle of patterned dp (a scrap) as a mat for it and corner punched it, also. 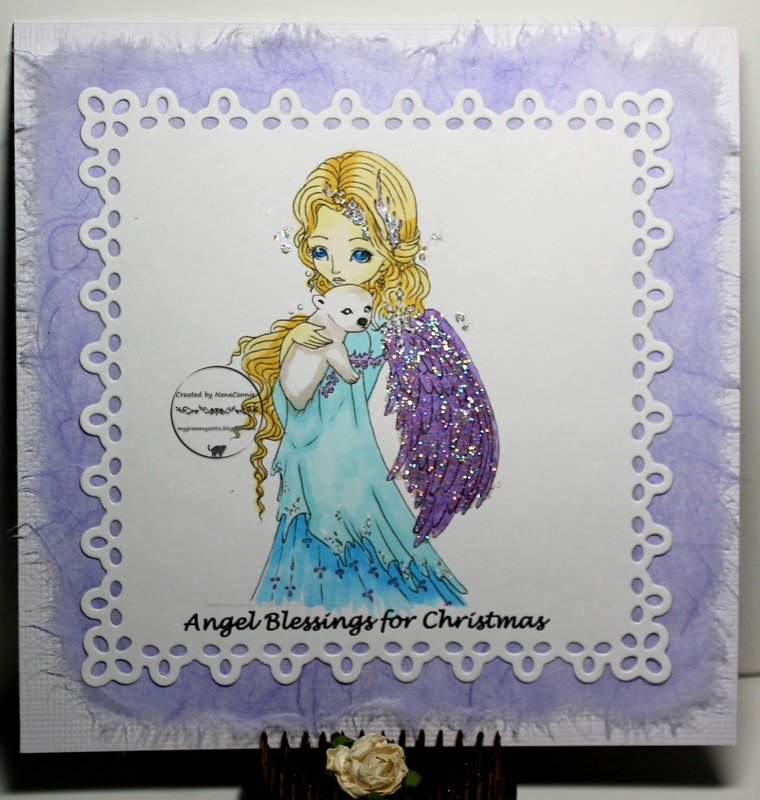 The die cut doily was done with die from Spellbinders. The dp is from SU and is double sided so I got to choose the side I liked best. I have 2 posts today and that's what happens when you have access to borrowed crafting goodies, to markers and colored pencils, and a camera! 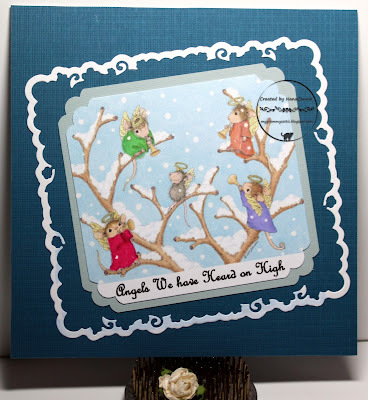 I think I've fallen in love with two more House Mouse stamps and I may even have to add them to my collection before next Christmas season, if they are still available. This one is all about Angel Mice and you'll have to check back in a bit to see the second one. This is the second time this season that I've used this card but those kitties, all bundled up in their winter-wear, are just so cute, I couldn't resist using them again. Can't you just see them trudging off to the family Christmas feast? They are from Bugaboo Stamps and I wanted to do a card that was very CAS and that could be used for a guy. I printed the image directly onto the card front and then colored it with my ProMarkers. I added a bit of blue for the sky and ice but that was mostly to get the white kitties to pop off the background. I printed the sentiment, hand cut it, inked the edges and fussed a bit before deciding that it should be up at the top of the card. I had planned a CAS design but it looked so plain that I pulled out some of my embossing folders to see what I might be able to do with them. I found the snowflake and icy swirl folder from Darice and embossed right over the colored image. Then I added the three, tiny, blue, pearls. 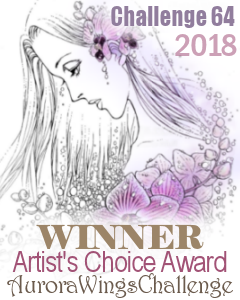 Finally, the sentiment piece was attached and the card was done - still CAS but with a bit more personality from the texture of the embossing. We all know about Scrooge's famous "Bah, Humbug" phrase but now there's "Bah, Hum-cat"and he's as Dickensonian as can be! Image is from Rick St. Dennis. I colored him with ProMarkers, then fussy cut the image. 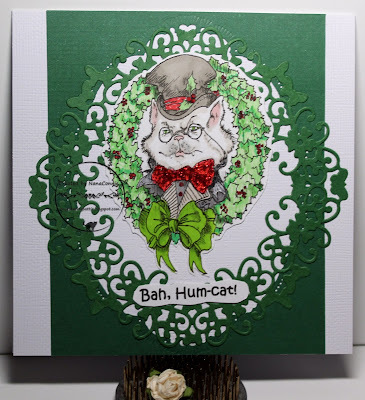 I used a die from Spellbinders to cut out an oval from a scrap of forest green CS, and trimmed it top and bottom to fit the size of the card. I was actually using not the oval die cut but the negative piece left behind. I saved the oval for some other project. 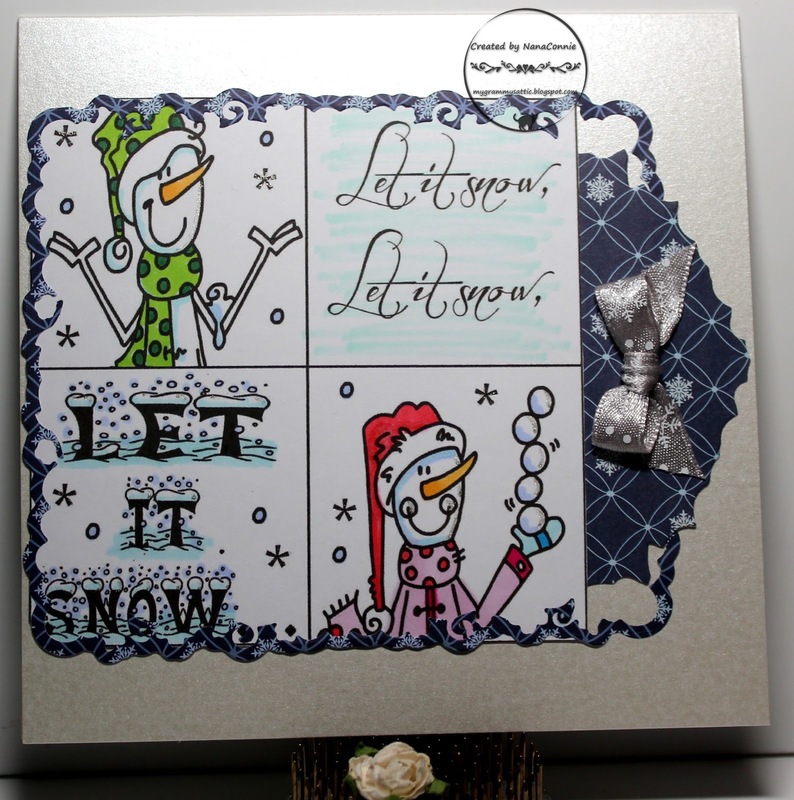 That went down on a white card base for a look of some winter snow behind the image. 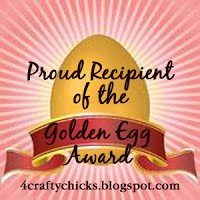 It looked a little bit plain with the image sent into the empty oval so I looked for something else to add. I found another scrap of green CS, dug out a Sue Wilson die, and used it to cut the delicate, filigree frame. I glued that down (a long and tedious process because of all the tiny curlicues) and then added the image and sentiment on top of it. Finally, I added a bit of red glitter to his bowtie for a tiny bit of sparkle. 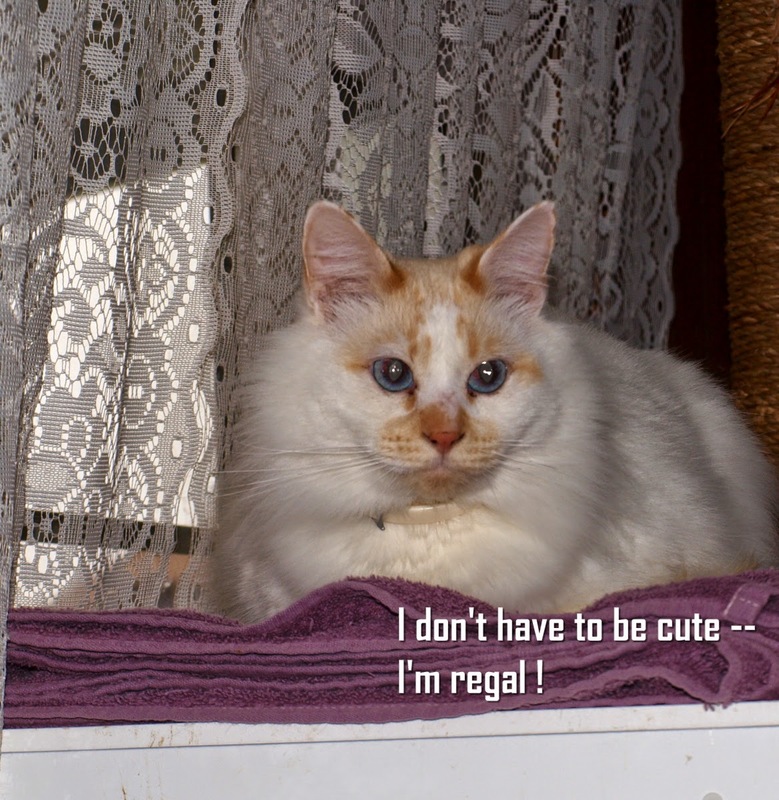 Well, it's Friday again and QKR Stampede has a new challenge up. We always have an Anything Goes theme but we also offer an optional theme if you choose to use it. Our optional theme this week is "Christmas Cards." 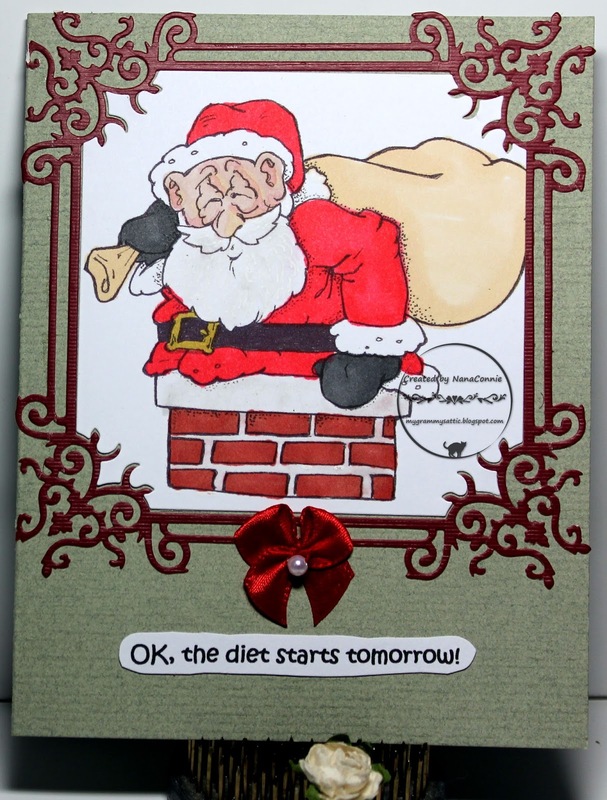 I chose a delightful "Santa" from the QKR store and a simple but appropriate sentiment, "Merry Christmas." Doesn't he make a fantastic, old-fashioned, Father Christmas? I used ProMarkers to color and a die from Spellbinders to cut the image. I inked the edges of the sentiment piece after hand cutting it, then added it. That whole piece went onto the front of a pre-made, red card base. 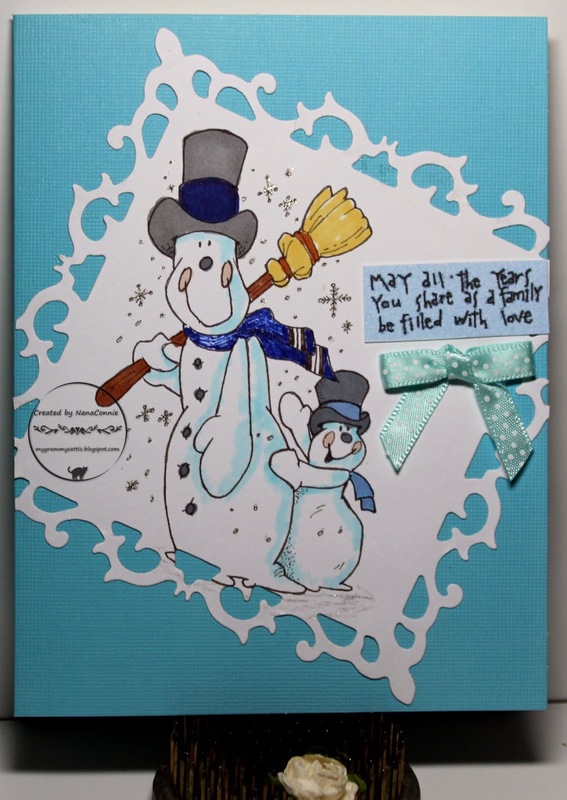 For embellishment, I added a glittered, snowflake button and three shiny, glittery packages to the bottom of the card. I love the gems and gold pearls on those packages. 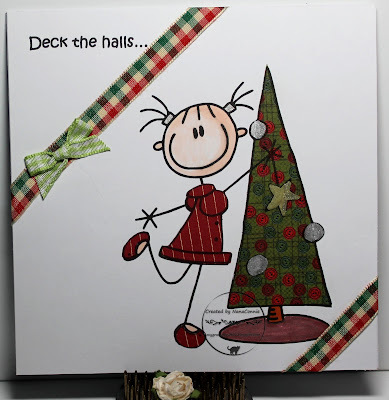 I absolutely love the image from the Sasayaki Glitter Progressive Challenge this month and it's perfect for my daughter-in-law who has an almost-Christmas birthday that often gets lost in the rush of all the holiday festivities. I try to do a separate birthday card for her every year, in addition to her Christmas card. 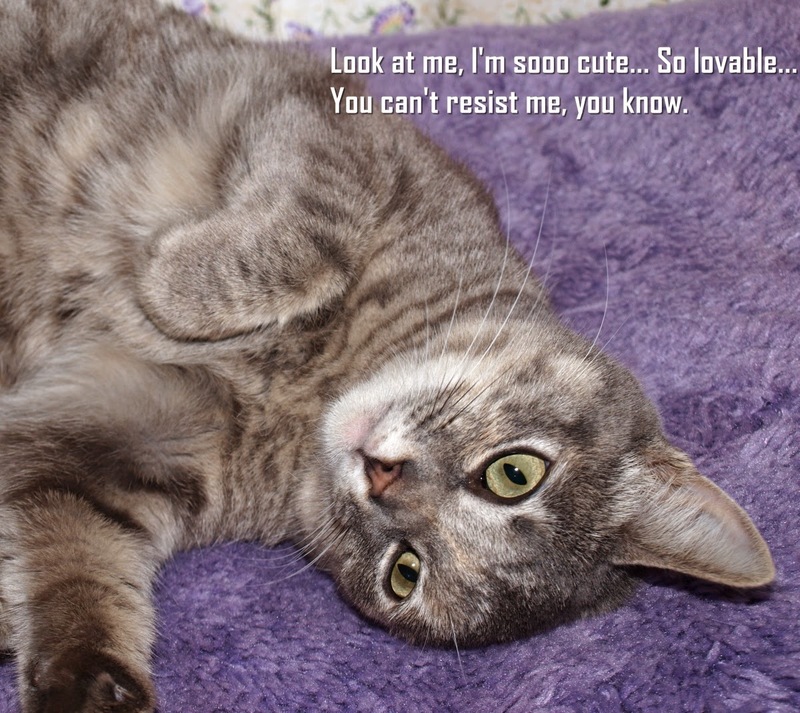 I know she'll love the silly sentiment on this one. Everything was done with scraps this time, including printing the image onto a scrap of white CS. I colored the image with ProMarkers, but the gold and silver gift bags are colored with metallic paint pens. 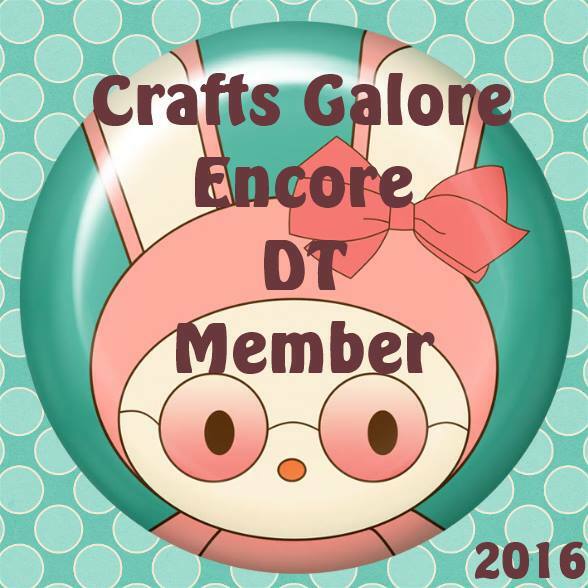 I then cut the image with a die from Spellbinders. The dark green frame was also cut from a scrap with another die that same set. 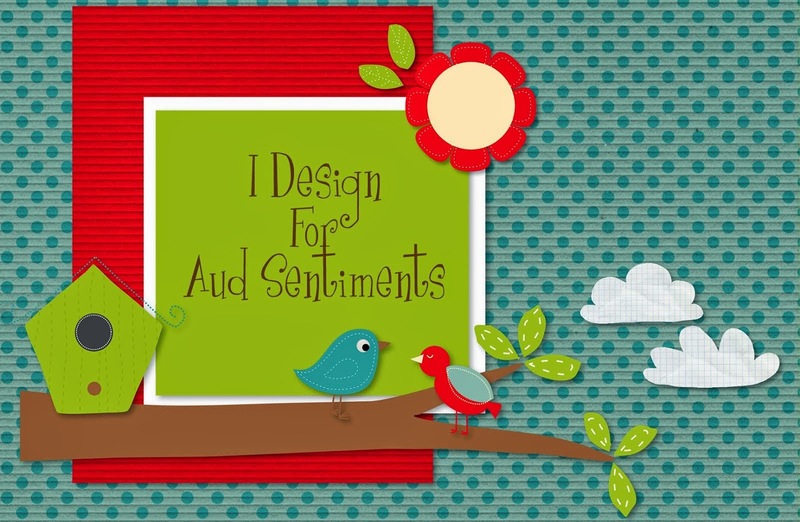 The sentiment is printed with a computer font, then hand cut, inked along the edges, and mounted onto the bottom of the image piece. I added a bow, made with a scrap of sheer ribbon and 'dyed' green with a marker, then sewn together with a tiny pearl. 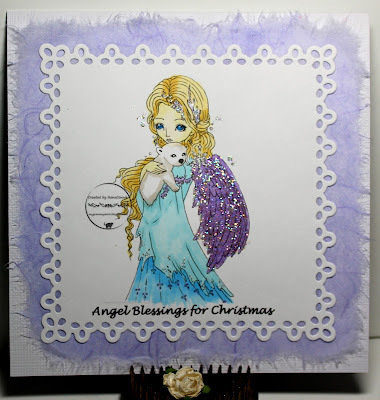 I used ProMarkers to color the image, then cut it with a pinpoint die from Memory Box. 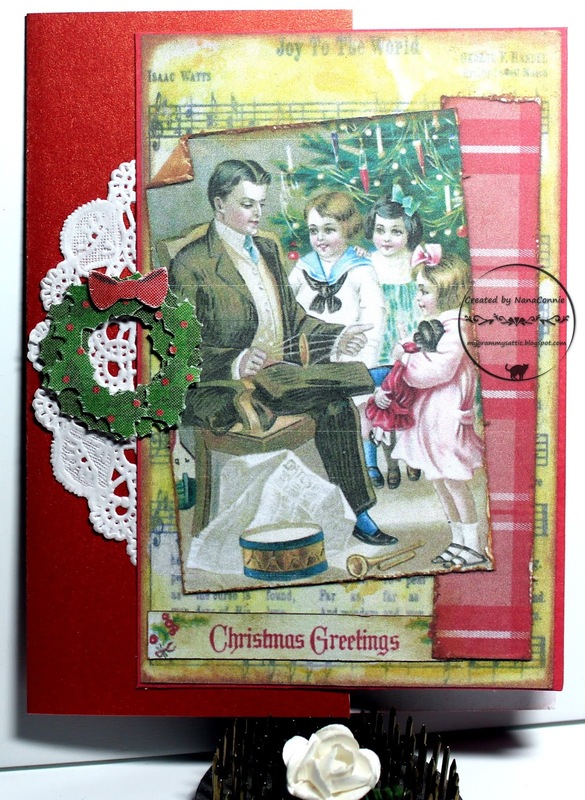 I chose a deep pink card base, which looks red in the photo but it really is pink. 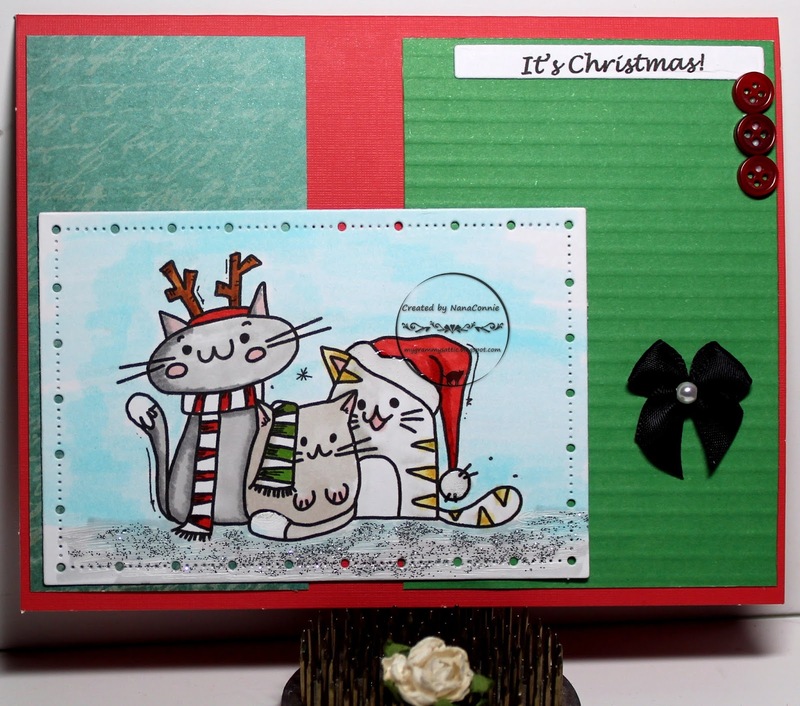 The background die cut was a gift from one of the ladies in the Card Chain Challenge. I do wish I could remember which lady because I'd love to give her full credit and a huge thanks. It's just so perfect for this card! Wish I knew what company made that die. It would definitely come to live at my house. I found a scrap of gray CS, ran it through my "linen" embossing folder, and added it to the card base. 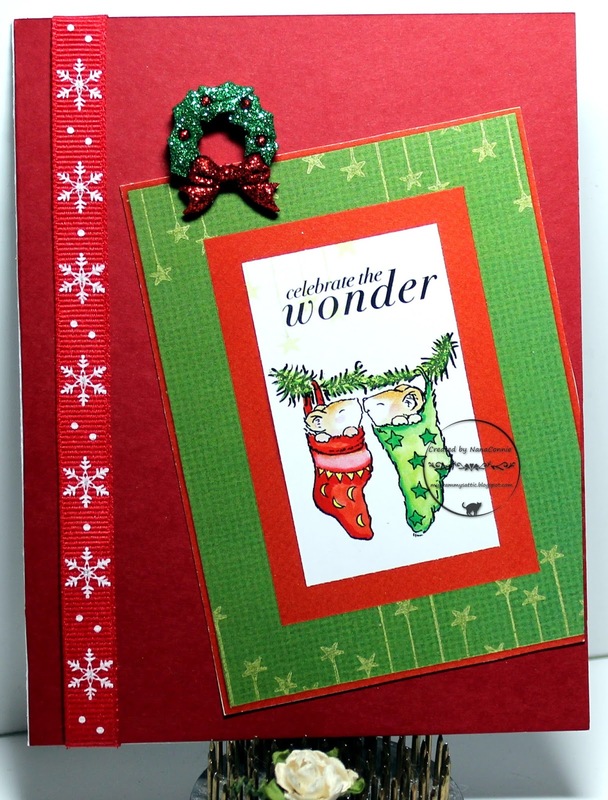 Then I layered on the die cut and the image. I tied one of my bow-tie bows using pink satin ribbon, and added it to the background. I thought that was enough embellishment. I really didn't want to cover up any more of that gorgeous die cut. Time for one more Progressive Challenge, this time for The Outlawz. The image was drawn by Sandra VanBlaricum, a member of the Outlawz team. Thanks, Sandra! I colored with ProMarkers, added both gold and silver glitter, then cut the image with a simple, square die from Spellbinders. I used gold paint pen to ink the edges of the image. The green, metallic paper is a recycling effort - those are candy wrappers which I deliberately rolled up and unrolled, then smoothed out using just my fingers because I wanted the wrinkle lines. Everything is mounted onto a confetti CS card base and I added one of my hand sewn bows. The bow was originally done using white ribbon but I 'dyed' it with marker to get the gold color to match the bows on the baubles. 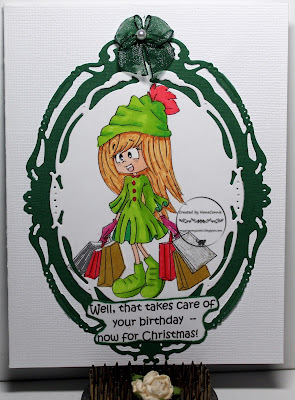 Good heavens, last month I did a card with a Beccy's Place image every single day and thought I had used all of the winter/Christmas images of hers that I had. 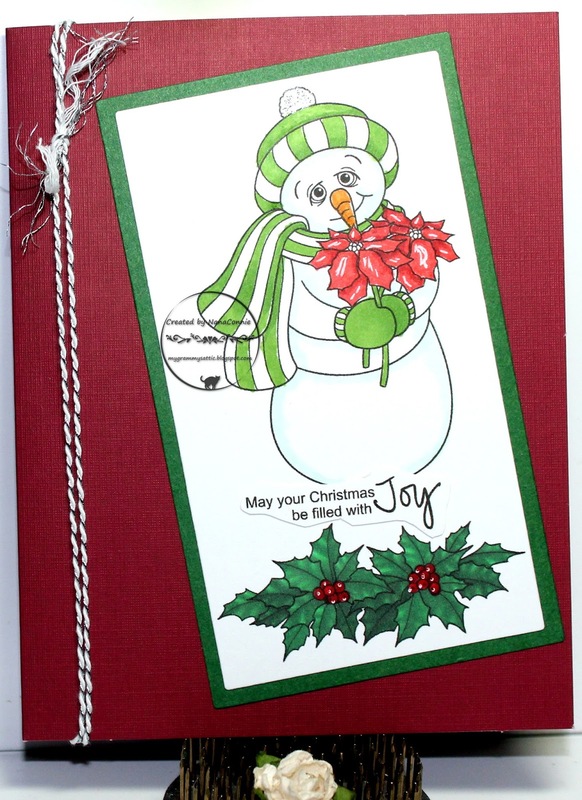 Then I found this delightful snowman with his arms full of poinsettia flowers which I've never used before! I merged it with the poinsettia border before printing it. I started with the colors in this photo from House of Cards. I colored with ProMarkers, added sparkly glitter to the pom pom on his hat, and cut both the image and the mat with dies from QuicKutz. I layered those onto a pre-made card blank and added some silver and white baker's twine (which has also been in my stash forever, completely unused.) I printed the sentiment, hand-cut it, and added it; a nice CAS design which will mail quite easily. 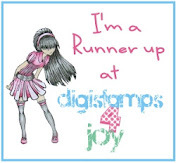 I love stamps from A Day for Daisies and was so sad when they closed their challenges. 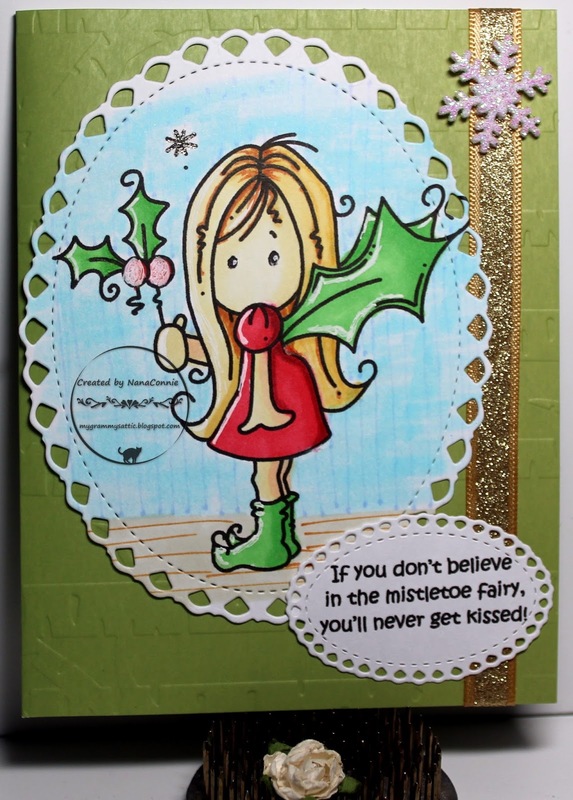 Fortunately, their store is still open and active so I can find fun images like this darling Christmas Fairy. 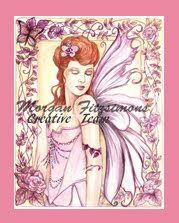 I printed the image onto a scrap of white CS, then colored with ProMarkers, and added loose glitter to her wings. After it dried, I cut it with a die from Spellbinders. 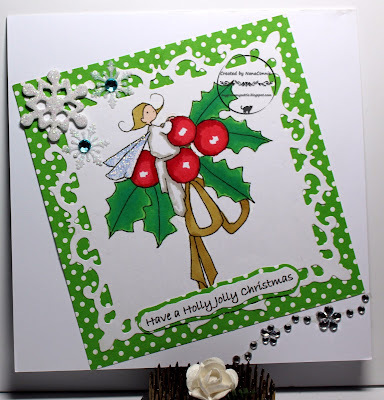 I used a square die from QuicKutz to cut another scrap of green polka dot dp. 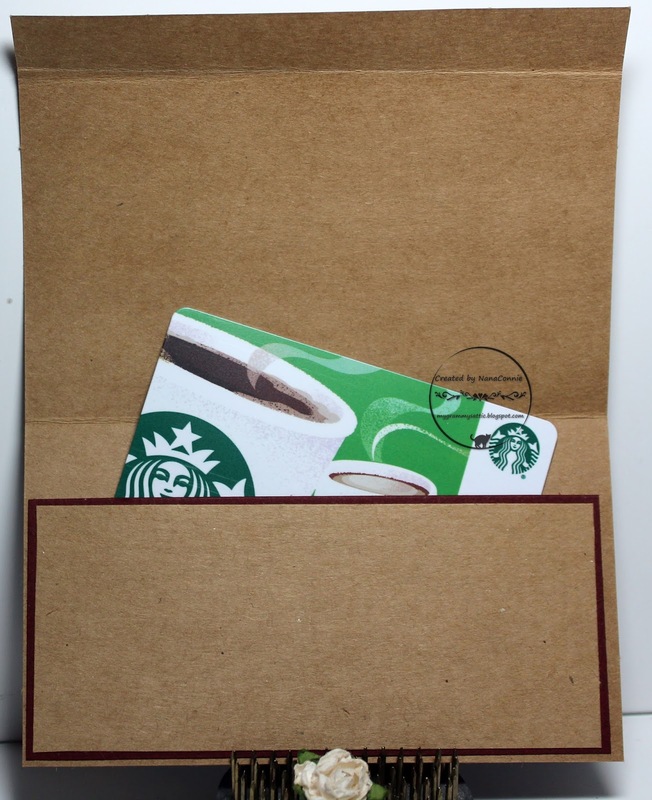 I layered those together and put them onto the card front on an angle. I added three snowflakes, all glittered, and a few gems and left all the rest of the space white for a CAS card, easily mailed. 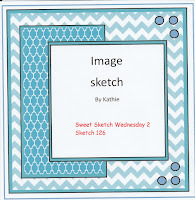 Last day of the week-long Holiday Chaos at Catch the Bug and today we get a freebie to use plus an inspiration photo. 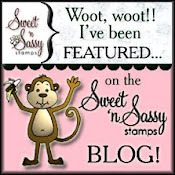 I'm so tickled that I managed to do a new card each day and to use a Bugaboo Stamps image each time. That part wasn't required but I do love Bugaboo so why not? This image is the freebie from Bugaboo and I colored her face and hands with ProMarkers plus used metallic ink on the star and ornaments on the tree. Then rest is paper pieced. 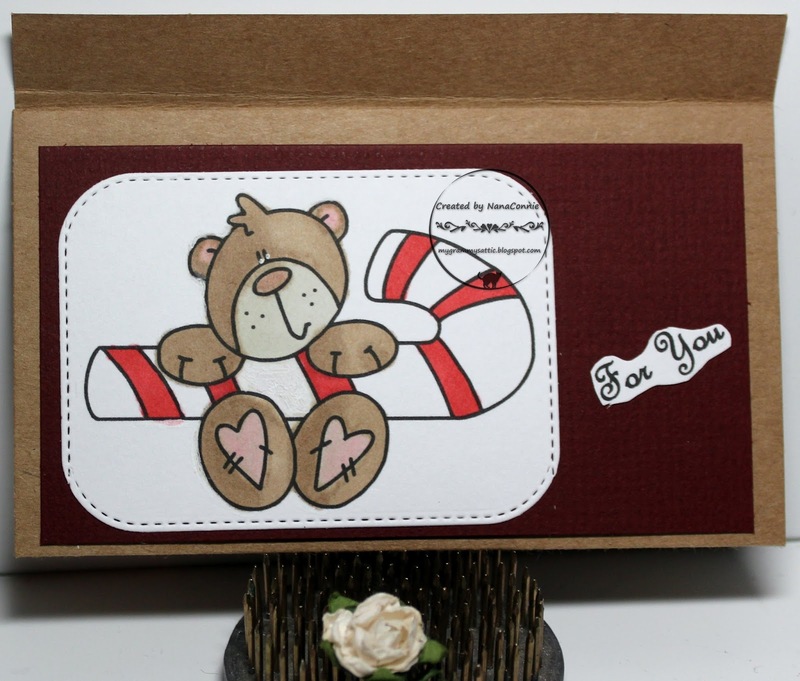 Both the image and the sentiment are printed directly onto the card front for a single layer card. I added strips of gingham plaid ribbon and tied a bow from pale green gingham ribbon. I thought a CAS design best matched the childlike drawing of the image. 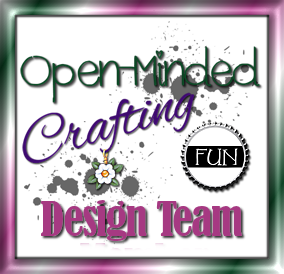 We start another "Anything Goes" challenge at QKR Stampede today and we also have an optional theme of "Non-Traditional Colors." I thought it would be great to contrast non-traditional and completely neutral colors with an image that is so traditional, it's really basic to the whole celebration of Christmas. It's from QKR and is titled "Shepherd 8714." The sentiment is "The Reason 8712." 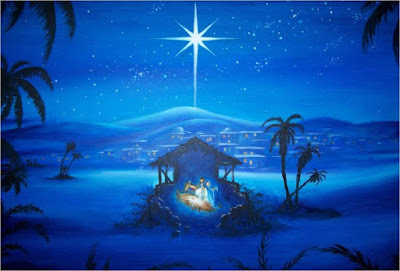 It makes me think of the lovely Christmas carol "O Little Town of Bethlehem." 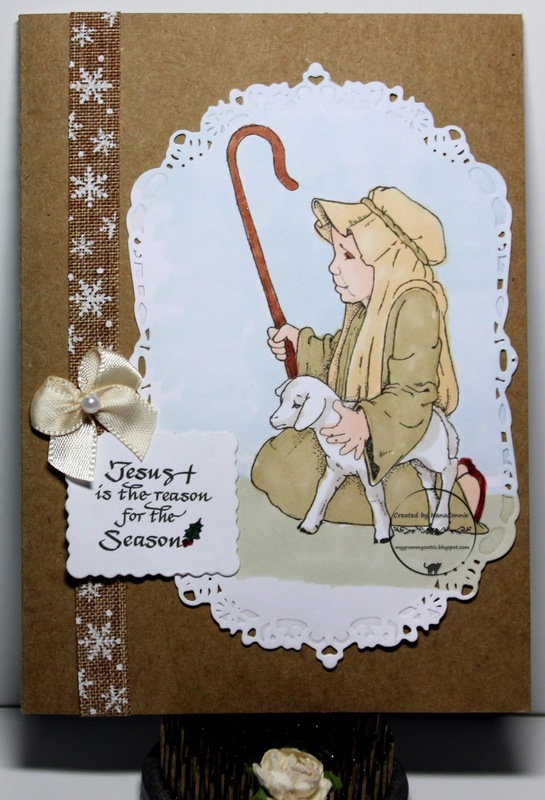 I colored the Shepherd with ProMarkers, did the ground and sky with polychromos colored pencils blended with gamsol, then cut it with a die from Spellbinders. The sentiment was printed and cut with a die from QuicKutz. I added the image to a kraft card base and dug through my stash for the snowflake and kraft ribbon. I layered on the sentiment and added an off-white satin bow. I really thought that a CAS design was best for showcasing the image. I can say "Let it snow!" all I want because I live where it doesn't snow and I don't have to shovel it to get out of my driveway or down my steps to the sidewalk. 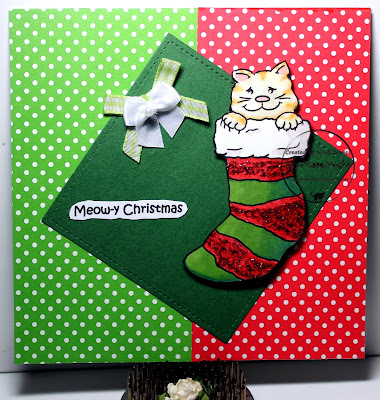 lol But this card is for Day 6 of the Holiday Chaos at Catch the Bug challenge. 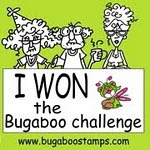 I think I've used this Bugaboo Stamps image every Christmas since I got it a few years back. We have to use this inspiration for our theme. I started by coloring with my ProMarkers, then cut it into a square. 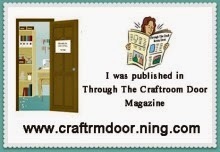 I cut a narrow frame for it by using two dies (inside and outside) from Sue Wilson. I also cut out the shaped piece with another die from that same set and used it tucked under the side of the image, as a mat for the hand tied bow. This was extremely difficult to photograph because I used shiny silver-white CS for the card base and it had a glare regardless of the angle at which I shot it. But I love the look of it IRL ! All of us know about Santa and his elves, plus his magical flying reindeer but how many of you know about Mistletoe Fairies? 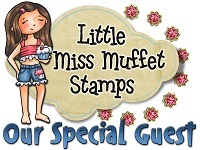 Bugaboo Stamps knows about them! And the theme at Catch the Bug's Holiday Chaos today is "Make It Funny." I hope you get a grin out of this one. Once again, I used my ProMarkers to color the image, then cut it with an Unbranded die. 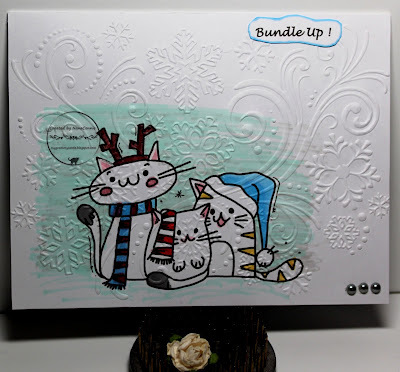 I added those to an embossed card base. 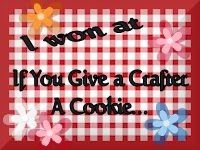 The sentiment is my own and it's also cut with another die from that same set. I added glittered ribbon and one glittered snowflake. I printed the image on kraft CS and colored it with ProMarkers. 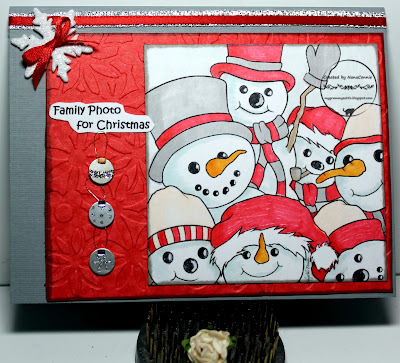 I used white gel ink for the snowflakes and snow. I love the way white becomes so bright against the kraft. 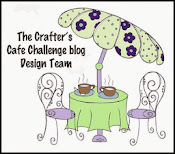 It's the last challenge of 2017 over at 2 Crafty Critter Crazies and we have a new sponsor, Sasayaki Glitter. I've played in many of their challenges and progressives and I'm just tickled to pieces to have them as a sponsor. I'm using "Christmas Dragoon." 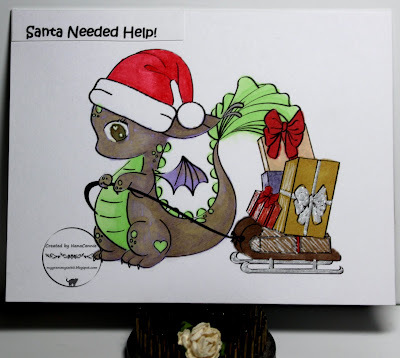 I know that dragons aren't typical Christmas animals but my eldest granddaughter loves dragons (as do I) and I see no reason why they can't participate in this wonderful winter holiday. They beat out penguins (who are basking in their summer during December) and lazy mama polar bears hibernating away with tiny cubs, and certainly are more delightful than Calling Birds or Partridges. Yes, they are definitely my favorites because they are so unexpected! Santa has his sleigh and Dragoon has his sled. I hope his tiny wings will be enough to take off with that heavy load. The image is printed right onto the card base because I wanted this one to be very CAS. 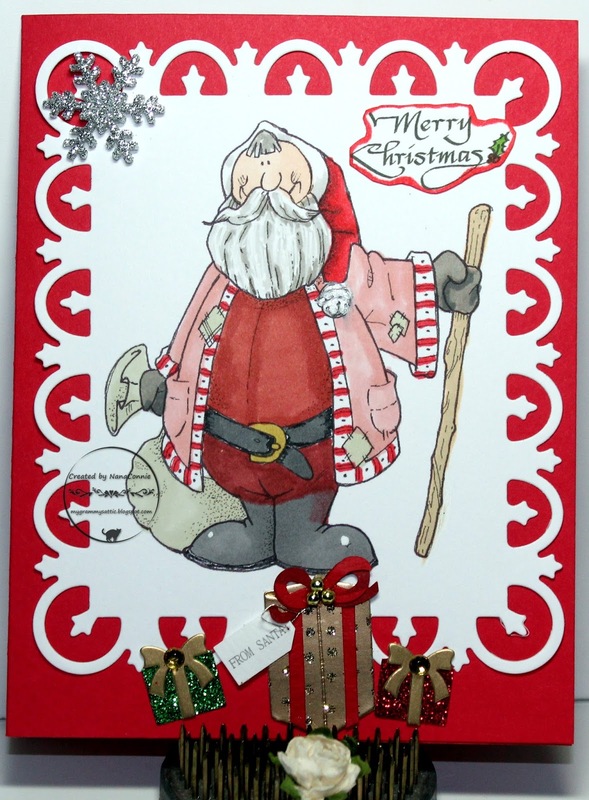 I used ProMarkers to color the image and added a bit of sparkly gold and silver to the package wrappings and the sled runners. I did print the sentiment separately, then hand cut it and added it to the upper corner but other than that, it's a single layer card. Come play with us. 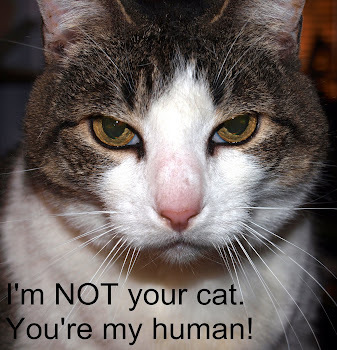 Remember, we always have a theme of "Anything Goes with a Critter" and we have a very broad interpretation of "critter." 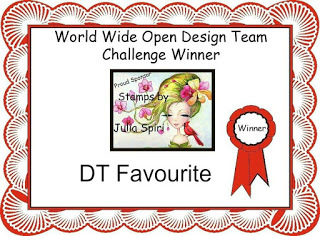 :-D Happy Stamping.